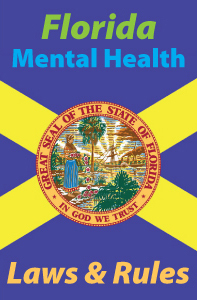 Florida Mental Health Laws and Rules is a 3-hour online continuing education (CE) course that is approved to meet the requirements of a Florida Laws and Rules course as a license renewal requirement for Florida-licensed clinical social workers, marriage and family therapists, and mental health counselors. It is required every third biennium after initial licensure. Content of this course will include excerpts from the relevant Florida statutes and Administrative Code regulating the practice of social work, marriage and family therapy and mental health counseling, along with interpretive commentary and case examples. Included are Chapter 491 of the Florida Statutes – the practice act for these named professionals, Chapter 64B4 of the Florida Administrative Code – establishing the Board of Clinical Social Work, Marriage & Family Therapy & Mental Health Counseling, and selected sections from Chapters 39, 394, and 456 of the Florida Statutes. Emphasis is on those issues most important for practicing mental health clinicians in delivering ethical, legal, and competent professional services while attending to prudent risk management practices. The goal of this course is to make life easier for clinicians by presenting a brief summary of the relevant laws and rules of practice in the State of Florida, leading to an ever-increasing awareness of and conscious compliance with the particulars of those bodies of legislation. Professional Development Resources is approved by the American Psychological Association (APA) to sponsor continuing education for psychologists; by the National Board of Certified Counselors (NBCC ACEP #5590); the Association of Social Work Boards (ASWB #1046, ACE Program); and the Florida Board of Clinical Social Work, Marriage & Family Therapy, and Mental Health Counseling (#BAP346) and is CE Broker compliant.